My eyes aren't that good but this looks very interesting! Thanks a lot. this is an article from a magazine called THE CRUNCH..do i have your email address , perhaps i could send it to you if you wanted to read it. You do have my address but please don't worry, my email is playing up at the moment and I'm trying to avoid it! Thanks anyway. Thankyou and you are very welcome and I have just been saying to S2K it feels quite lonely on here at the moment so I am most grateful to have you around. 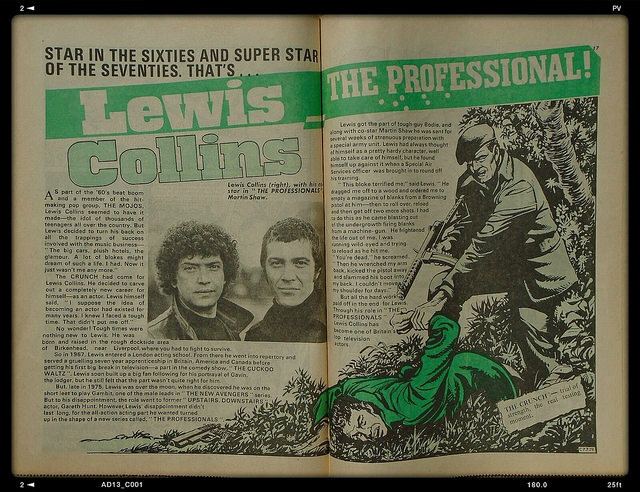 you are very welcome...i won this magazine on ebay and it tells of Lewis's role as he starts off playing Bodie and what he was put through in the beginnning. Thankyou and it's wonderful to hear from you. Another one that's completely new to me. Glad you were able to win the auction for it. you are very welcome and it took a nervous wait and some finger crossing to see if i had won it. It's lovely to hear from you and thankyou for looking.